Earlier this month, I received this e-newsletter from the Brisbane Powerhouse and noticed this. So with not much expectation, I emailed to see if I would win any tickets. 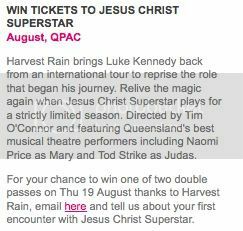 I just received the Brisbane Powerhouse newsletter and am really hoping to win tickets to see Jesus Christ Superstar. My first encounter with the musical was the 1973 movie. My dad was an avid fan and desperately wanted me and my siblings to watch it too, but by this time, it was the mid-80s and the number of titles out on VHS wasn't very widespread. We finally found a copy at some bootleg counter and despite every reservation my dad had about buying bootleg videos, he bought the tape and we all watched it. I don't know about my siblings, but I was blown away. Suddenly all the songs my dad used to hum suddenly made sense and I fell in love with everything Jesus Christ Superstar (including Ted Neeley, but that's a different story). Tacky, I know, but I simply couldn't help it. So there you go - my first encounter with Jesus Christ Superstar. I'd love to relive that moment of wonder through watching the production on stage and have my fingers crossed. Wow! :) Let me know if it's any good. Will do! I've never seen to a real-time musical before, so it'll be a virgin experience. AWESOME!! Did you just make that up?? Cause honestly, I don't remember a thing about Jesus Christ Superstar. And I still can't watch it cause Sebastian thinks it's too tacky. I'll probably watch it when he's not around. Congrats though! Would love to catch it too! How can you not remember the movie?!?! Hippy Jesus was awesome!